Spectinomycin is an aminocyclitol antibiotic isolated from Streptomyces spectabilis. It is effective against gram-positive and gram-negative bacteria, but most commonly used against Gonococcus species. It has also been used to monitor cell fate during leaf development and as a selection marker in plants to display successful transformation of the Spcr gene. Spectinomycin functions by binding the 30s ribosomal subunit, inhibiting tRNA translation and protein synthesis. Resistance to this antibiotic is conferred through the aadA gene and mutated rpsE gene. The Spectinomycin Dihydrochloride Pentahydrate EZ Pak™ is the fastest and easiest way to make a set amount of sterile spectimomycin dihydrochloride solution. The kit includes pre-weighed spectimomycin dihydrochloride powder, a sterile filter and a sterile container for the filtered solution. No need to calculate, simply add the stated amount of deionized H₂O, filter, and pour into the labeled bottle for easy usage. 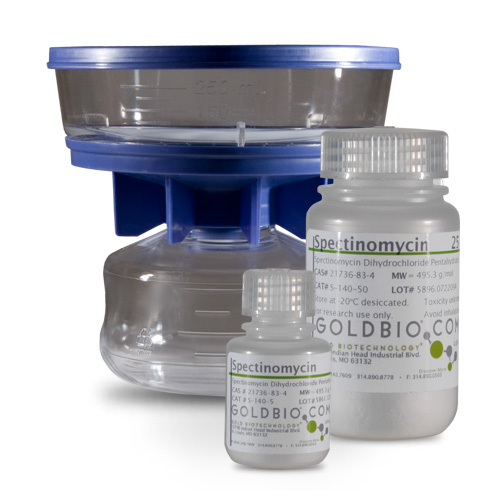 The EZ Pak™ includes high quality GoldBio spectimomycin dihydrochloride and the sterile solution is ready for tissue culture, bacterial media or any number of uses. EZ-Pak Protocol for Reconstitution and Filtration of Spectinomycin.